A few weeks ago, the AP reported on a missing hunter found dead near Mount St. Helens (full story). This article, which was in all the local papers, radio and TV networks in the Northwest, describes a tragic accident. At this time I still do not know how David Sherwood died while hunting. The news people did not include the details. The question is, have you or do you hunt alone? Do you hunt by yourself often? I do. In Washington State we have a High Buck Hunt from September 15 to 25–a three-point or better hunt. This is an early modern rifle or muzzleloader hunt in wilderness areas, meaning you have to go in by foot or horseback. No wheeled vehicles! Since I do not have access to horses, I hike in. 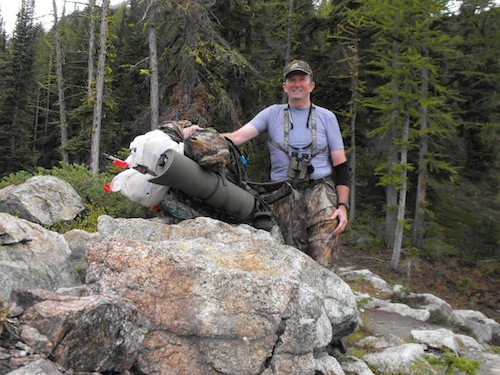 I hunt in the Glacier Peak Wilderness in the North Cascade Range in Central Washington. 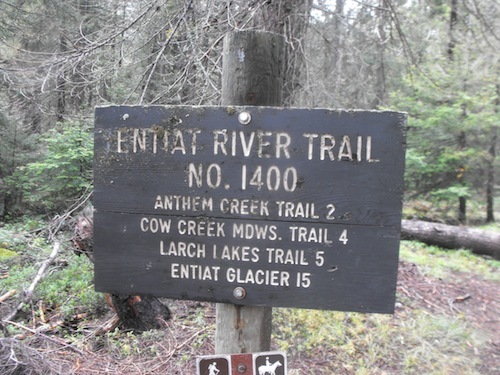 The trailhead starts 33 miles from the Entiat on state Highway 97. You can drive to the end of the road, which is about three miles from to the border of the wilderness. Some hunters use off-road bikes from the end of the road to the trailhead wilderness and then drop them off there and hope they are still there when they come back. You must have a Wilderness Pass vehicle pass to park in the lot. With our hunting licenses in Washington State we get a hunting vehicle pass, but this is not good for the National Forest areas. You must purchase a yearly or daily pass. I have seen many hunters get $125 tickets for using the wrong pass while parking their trucks in this wilderness area parking lot. The game area I hunt is comprised of several different Game Management Units. It is part of Slide Ridge #246, Chiwawa #245 and Clark #244. These areas, just west of Lake Chelan, are well maintained and are usually in pretty good shape by the time hunting season comes around. The trail is pretty flat along the Entiat River valley, but as soon as you want to hunt they all seem to go straight up. The Game Department suggests the best hunting is above the tree line. I have gone up to this wilderness area 4 times in the last two years. The first year was 2009. I packed in from the parking lot, three miles to the boundary border (where you can start hunting) and then beyond. The first time, I went up to Larch Lakes on trail #1430. The trail went from the 3,800-foot level, by the river, to around 6,000-foot level in about four miles when you got up to the lakes. The trail was in good shape. It crossed several creeks (no bridges) and switched backed along the Larch Lakes Creek. 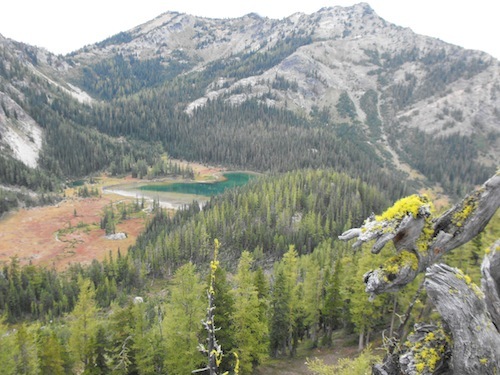 The Larch Lakes are two high mountain lakes set in large, bowl-like surroundings. Wow, what a view! When you come around the last corner to the lakes every high mountain buck could see you for miles. 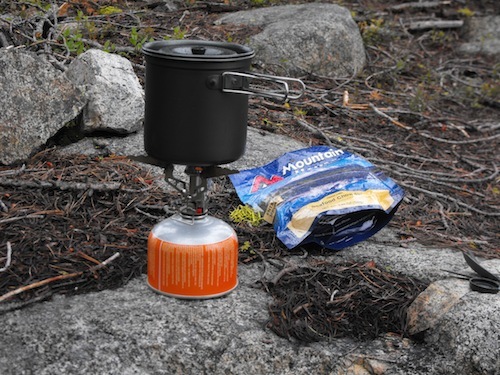 My other three trips consisted of going up the #1400 Trail towards Snow Brushy Creek, Trail # 1435 up Duncan Hill trail and Trail #1404 to Cow Creek Meadows and then over Fifth of July Mountain Trail #1408 to Larch Lakes, then back down Trail #1430 trail to Trail #1400 and back to the parking lot. Of course on every one of these trips I was by myself. I hunted alone. Why, you ask? Well, my hunting partners didn’t want to train to hike up to these areas, and they didn’t have the gear. I didn’t have anyone to go with, yet I still wanted to know two things: 1) Could I train to prepare for this, and 2) Did I have the will and courage to do so alone? Yes to both questions. Like any rookie I packed too much on the first trip. 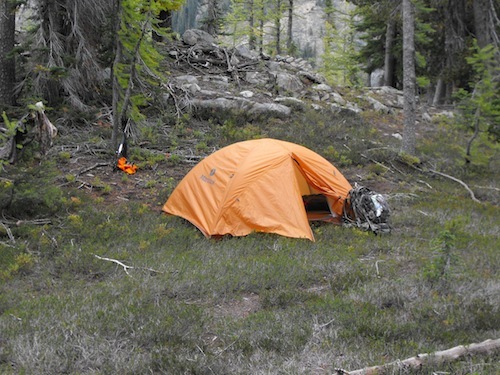 I had about 60 lbs of gear: sleeping bag, mat, tent, cooking utensils, food, rifle, bullets, knives, water purifier and water. I found out water was the most needed item. I saw deer on all these hunts but did not find the one I was looking for. There were also a lot of black bear in this area too, but I wanted a big mule deer buck. I also carried my Garmin Rino 520HCx GPS with me. This is a valuable tool. Even though I took several Green Trails Maps, my Rino was reliable in finding my way. I do feel very bad for David Sherwood, his family and friends but he was doing what he loved to do. I did likewise. My determination, my will and my love for hunting drove me to do the same thing he was doing, luckily nothing happened to me on my pursuit of the hunt. I'd like us to stay in touch. Click my RSS feed to get every post delivered for free, or subscribe by email under the picture on the right. Thanks for visiting! I rarely hunt alone, but when I do, I always let someone know where I’m going to be. Luckily, someone’s usually not more than a mile away if something were to happen. Corey, It is always preferred to hunt with someone, but at least leave great directions, a map, road numbers and when you will return always helps.